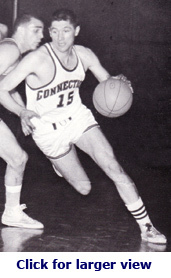 Dom Perno was a Guard for the UConn basketball team from 1960 -1964 and he is a member of the UConn Basketball All Century Ballot. He was an Assistant Basketball Coach for five years before becoming the Head Basketball Coach at UConn for nine years, 1977 - 1986. He is currently the Associate Athletic Director for the Athletic Department at George Washington University. I met Dom in December 2003 when GW University was playing in CT. Dom was here for the game and he shared some of his experiences, memories and thoughts on UConn basketball. Dom went to Wilbur Cross High School in New Haven, CT. His team won 49 straight games, two state titles and a Northeast Championship. Then he went to a small prep school called “The University School” in Bridgeport, CT for a year before going to UConn. He thought about going to Fairfield University or Boston College as well as a number of other schools but didn’t want to go too far from home. He decided on UConn. Dom really enjoyed going to UConn and being able to go home when he wanted to. Later, as a coach, he recruited many of his players from the state of CT. He was so familiar with the area that he was able to get many in-state players to come to UConn. 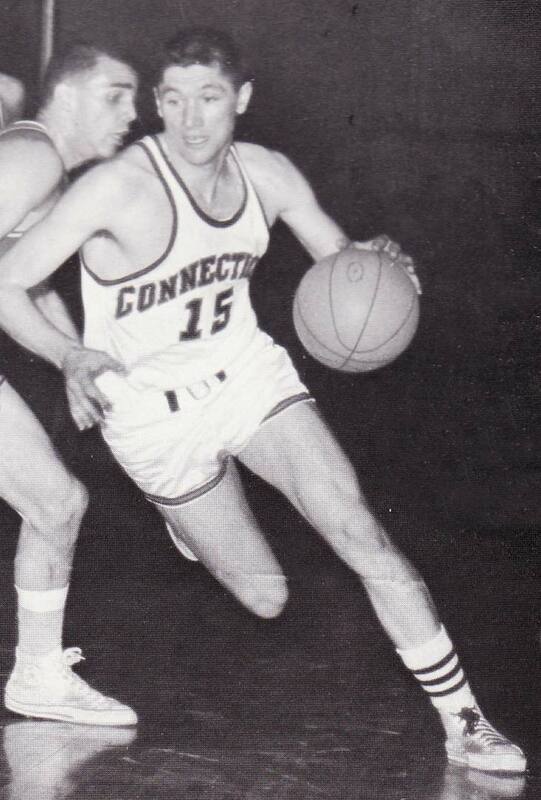 In the ‘60s, CT basketball teams did well. CT was in the Yankee Conference and won it almost every year. Winning a conference led to an automatic bid to the National Collegiate Athletic Association Tournament and there were only 32 teams in the NCAA at the time. When Dom was a senior, the team won two games so they made it to the Final Eight. UConn had beaten Temple University and Princeton University, which was a great memory for Dom because Princeton had Bill Bradley on the team. If UConn had beaten Duke University, the team would have gone to the Final Four. Dom lives in Old Town Alexandria in DC. He and his wife, Cynthia, love the area, which is only five miles from GW University, but he said it was tough to leave CT. Dom has a daughter, Holly, who is a guidance counselor in Wilmington, NC, a son Dom who works in the insurance industry in CT and lives in Wallingford, CT and he has another son Matt who also works in the insurance business and lives in Chicago, IL. Dom’s most memorable time at UConn as a player was as a senior going to the Final Eight while he was captain of the team. As a coach, the highlight for him was in his second year as head coach when the team won 21 games, which was very significant at the time. The team went to the NCAA, played Syracuse and was down by 18 and brought the lead down to two. Another game Dom remembered was a game against UMass at the Hartford Civic Center. After they played the game, later that night, the Civic Center collapsed. Luckily the event was over and everyone had already left the building. Dom shared his thoughts on the current team making it to the Final Four. He said they certainly have the talent and the ingredients to go a long distance with players like Emeka Okafor, Ben Gordon and Charlie Villanueva. He thinks this will be an exciting year at UConn and he plans to be at the Final Four in April.